The lecture allows you to reveal the basic concepts and problems of the studied field of science, to give students an idea of ​​the essence of the subject, to demonstrate the relationship with other related disciplines. It is the oral presentation of the material that is the basis for the further use of such forms of study as seminars, workshops, laboratory work, coursework, diplomas, and more. During the lecture on the discipline “Child infections diseases” for students of the 6th course, Dr. med. 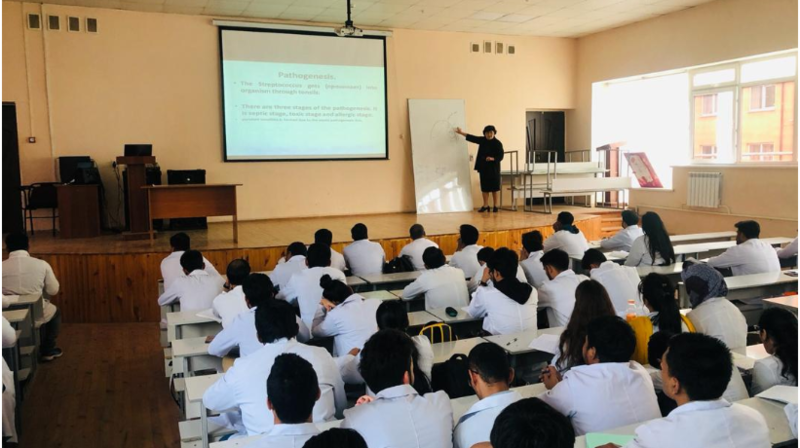 Z. K. Dzholbunova used the main methods of conducting lectures such as: lecture visualization, lecture-presentation, lecture with pre-planned errors, use of clinical cases. Such lectures enhance the close interaction of the lecturer with the participants, their activity, as well as the development of their clinical thinking. In addition, each topic was accompanied by a short video with a periodic discussion with the audience. Students with great interest finishing one topic, were looking forward to the next lecture.